A native of Jacksonville, FL. Phil Cay began his recording career with Phil Cay and the Blue Notes in Birmingham in the late 1950's. Above: Ray McStevension, Phil Cay, Dale Dunkin, Johny Bowman, Jimmie Davidson. 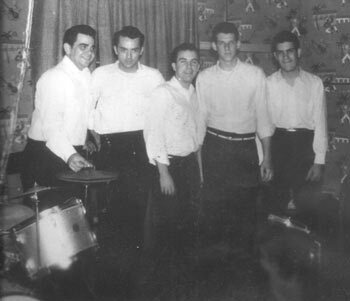 According to Phil, this was the original Phil Cay and the Blue Notes, photo taken at the American Legion, Lakeshore Blvd. 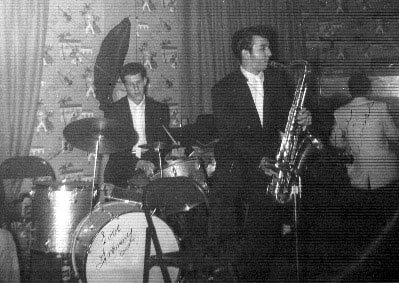 This photo was taken in 1958 and it was the first gig they played. They were discovered there by Henry Hartzog of Hart Records. They recorded over 15 records from 1958 to 1965. The first record by Phil Cay and the Blue Notes was "Meet Me in the Barnyard", on Hart. This fun rocker featured Vince Oliver on sax and an ending of canned farm animal sounds. Here's "Meet Me at the Barnyard", recorded 1958 and 59, released on Hart.